"At the Cinema", oil on canvas, 200 x 140 cm, 2009, by Katie Mavrommati. 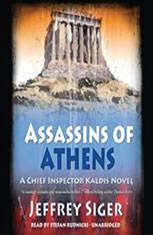 On a warm Athenian night you may want to do as the Athenians do. Enjoy the unique pleasure of watching a movie at one of the open-air movie theaters. Located on rooftop terraces, gardens, or jammed in vacant lots between apartment buildings, but others ideally located in specifically planned areas, these open-air movie theaters are the best bet for a quiet night out, offer respite from the warm enclosed alternatives and are a trademark of Athenian Summer culture. Often surrounded by bougainvillea, jasmin, gardenias, or potted plants and their aromas, some still with raw gravel under the feet of the audience, the occasional cat strolling in front of the canvas or painted wall serving as the screen, under the starry sky and the much wanted breeze of the midnight hours, the experience of an Athenian open-air movie theater may be unforgettable. The illuminated windows of the surrounding houses and apartments, often the sounds of the everyday life of the people who live there, the youngsters who watch free of charge from their balconies or the ability of outdoor smoking may complete the picture for you. A cult on its own right, often combined with a cold soda and pop corn, or even a beer or two with a hot dog or a piece of pizza, you will watch a movie that most likely you'll never forget. Movies in Greece are never dubbed, but, instead have subtitles in Greek, so non-natives will have no problem following and, hopefully, enjoying the plot. A beautiful open-air movie theater, situated on top of a water supply reservoir, within the lush vegetation of Dexameni Square, in Kolonaki, with a large screen and a loyal clientele. Enjoy the mostly contemporary film screenings in the heart of the historic Plaka district at Cine Paris, while having an unparalleled view of the Acropolis. The rooftop of Cine Paris is enclosed by lush greenery, tables to set your drink and/or snacks and comfortable director’s chairs. Old movie posters can be purchased at the ground floor. With the best night view of the Acropolis, Cine Thission has been ranked by CNN as #1 among the Most Enjoyable movie theaters in the World. 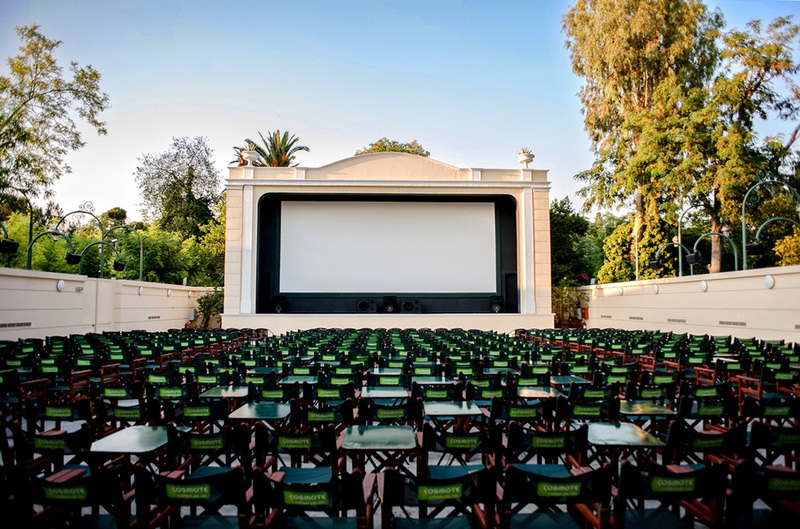 It is one of the oldest -if not the oldest- Athens open air cinemas, established in 1935, and it is majestically located on Apostolou Pavlou, the paved promenade that connects Thession with the intersection with Areopagitou street and the Philopappos Hill. Here you will enjoy both premiere releases of new blockbuster and independent films and also re-screenings of classic movies. The feeling created by the magnificent view and the nostalgic setting is unique. Live memorable moments in Cine Thissio and don’t forget to try the home-made tyropita (cheese pie) and other delicacies offered at the canteen just before the movie and during the mid-way intermission. Cine Psyri is a lovely outdoor movie theater, situated in the quarter of Psyri. Found in the backyard of a theater, during the winter months this lot operates as storage, but in the Summer, the place is converted into a lovely cinema that shows both old and new productions. Cine Psyri offers good sound quality while trees and bushes make you forget you are in the heart of a commercial district, as you are seated comfortably in cozy director’s chairs with handy small tables for your snacks. Cine Aigli, on the grounds of Zappeion Gardens, set in luscious green gardens, and a short walk from Syntagma Square in the heart of Athens, is certainly one of the classiest and best Athenian open-air movie theaters. 1903 was the year that marked the first movie projection, namely the French film “Ten women after a man”. The bougainvillea and jasmine, the glow worms, the canvas chairs, the starry sky and the pleasant chill that prompts you to put on something on your shoulders are all “rituals” of this open-air cinema. Great acoustics and first-rate service for the ones who care, and combined with tasty hand-made snacks, the historic Cine Aigli is the place that assembles all the characteristics of the “open-air cinema”. It offers Hi-Tech screenings of both blockbusters and classics and has the added advantage of having the restaurant and cafe of the same name next door. The canteen offers everything from popcorn to souvlaki and sangria.